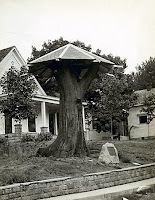 The TSGS Cruiser: "Indiana's Constitutional Elm Tree"
The tree is in the front yard of a log home that was built by Hiram Westfall in about 1810. The log home now has a 2 story frame addition (see last photo). The white frame house in the background is the house next to the property where the trunk of the Elm tree is located. The log house is to the left of this photo. The log home now has a 2 story frame addition. Hiram later moved to Gibson County. My wife is a descentant. Hiram Westfall & his wife Mary are buried in Antioch Cemetery, Montgomery Township of Gibson County, Indiana. The two people in the photos above & below are my wife, Susan Westfall Weiss, ggg granddaughter of Hiram Westfall and my daughter, Katie Weiss Newell, gggg granddaughter of Hiram Westfall. Log cabin built by Hiram Westfall about 1810. I am the GGGG Grandaughter of Hiram. I love the connection to the tree. We have been there with my children and taken similar pictures in the front yard. Have you had an opportunity to go in the house? Also do you have any information on Hiram's mother. I know her name is Hannah Ann, but I have no history on her.